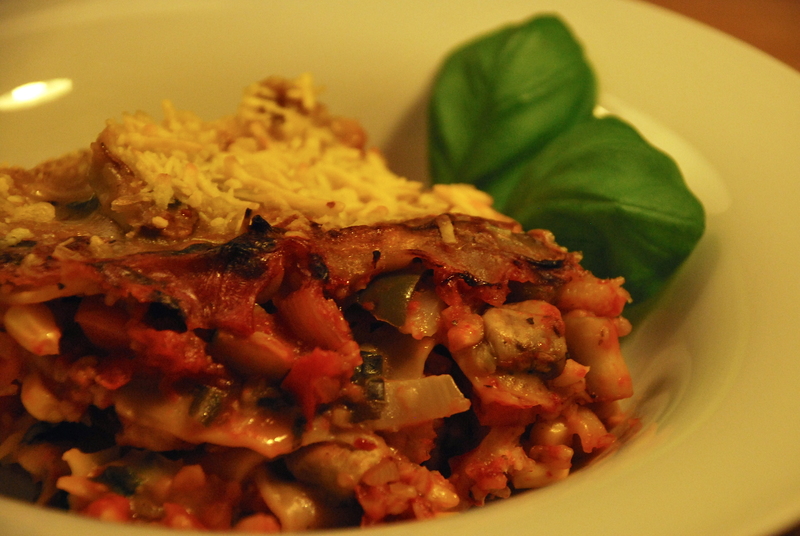 THE vegan Lasagna | vegänsch. Finally, I managed to take some photos and write down the recipe for one of my favourite dishes. 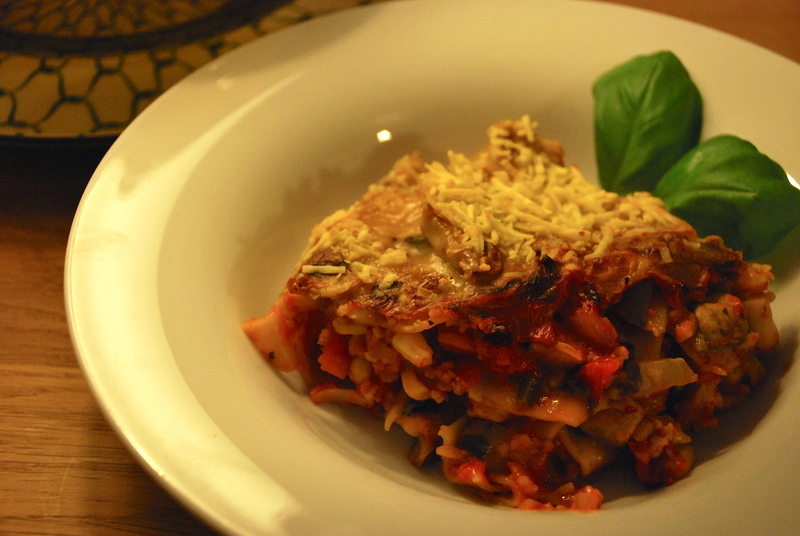 Yummy, warming, delicious soul-food lasagna stuffed with all kinds of veggies, filled with red and white sauce, and topped with a creamy yet crispy ‘cheese’ crust. Before you start, make sure to check out this cool and quick recipe video the guys from codecheck.info made – thanks again! Enough talking, on to the recipe. Don’t be put off by the long ingredients list, it’s easy! Serves three hungry people. To make the red sauce, heat some oil in a big pan or pot. Cut the vegetables into pieces and start frying them in order of the list, letting every kind of vegetable fry for about one or two minutes before adding the next one. They don’t have to be super tender, just a bit pre-softened before baking. Add the other ingredients and season to taste with Italian herbs, chili, paprica, salt and pepper. Set aside and put just a little bit of oil in a second pot for the white sauce. Add mushrooms and silver beet and fry for about 2 minutes. Push them to one side of the pot and put the margarine in the ‘free spot’. While it’s melting, stir the flour and about half a cup of water in a separate cup until it’s a creamy white mixture. Pour it in the pot with an additionally 1.5 cups of water, the nutritional yeast and vegetable stock powder. Stir until well combined. Add plant milk, vinegar, mustard, curry powder and spices and let simmer for a bit, stiring well. Preheat the oven to about 180° C (350° F), take a big casserole (I used a ~30 x 20 cm one) and cover the bottom with a bit of red sauce. Put a layer of lasagna sheets on top, then another portion of red sauce, then pasta again and so on. Somewhere in the middle, use about half of the white sauce as one layer. Use the rest of the white sauce for the last layer and sprinkle some grated vegan ‘cheese’ or Hefeschmelz/vegan ‘cheese sauce’ on top. Bake for about 45 minutes. Serve with basil leaves, freshly ground salt (I use Himalayan) and chili flakes. Enjoy! Before going off to get all the wonderful ingredients to make the lasagna, please consider reading my last post about a very important personal topic at the moment. Danke, and dig in! « Support medical progress & my first half-marathon.